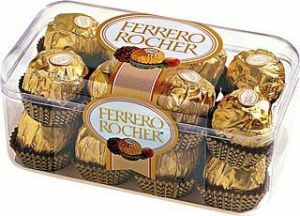 Ferrero Rocher was introduced in 1982. In just a few years it became the favourite chocolate treat for millions of people. Today it's the world leader in its category. So, what is the secret of its success? An original recipe, manufactured with the utmost attention, refined packaging and ground-breaking advertising campaigns. Its innovative shape (round but irregular) and its unmistakable golden wrapping give it that elegance that has made it famous and also hint at the unique taste of this speciality: a creamy filling, a crunchy wafer and a delicious hazelnut centre.